After months of extra training, Sitka Mountain Rescue passed the remaining portions of their re-accreditation test this weekend. This means they are once again a fully accredited mountain rescue team and can continue their work. Sitka Mountain Rescue is a group of over 50 volunteers, who train year-round to find find and aid lost and injured hikers in the Sitka area. Formed in the 1960s, they’re part of the Mountain Rescue Association, an international group of mountain rescue teams. Groups are re-tested and accredited by MRA every five years. Last year, the Sitka group went through the re-accreditation process. They passed most, but not all, of their skills tests. So they had to retest this year on the skills they didn’t pass. Team captain Ron Duvall says volunteers logged extra hours to ensure they were ready for steep angle and high angle scenarios. 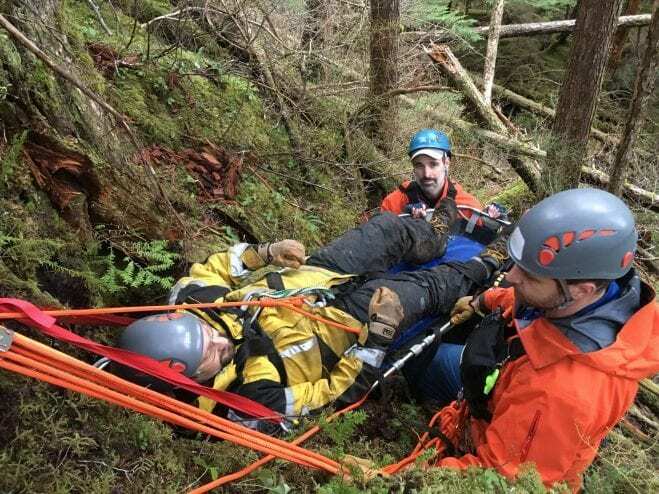 Over the weekend, four accreditors came to town- two from Alaska Mountain Rescue in Anchorage and two from Juneau Mountain Rescue- to evaluate Sitka’s volunteers and play the parts of injured hikers, waiting to be assisted. Duvall says during the “steep angle” scenario, for example, their evaluator played a hiker with a dislocated ankle. Screaming and yelling aside, the accreditors must have been pleased with Sitka Mountain Rescue’s performance. The group will be recognized as a fully-accredited mountain rescue at the Mountain Rescue Association conference this spring. NextCome and get your mug!